I suppose it’s about time I updated my [Simple Rails Multi-Tenancy](http://samuel.kadolph.com/2010/12/simple-rails-multi-tenancy/) post to use the latest rails [3.1.1](https://rubygems.org/gems/rails/versions/3.1.1). Not much has changed from the 3.0 beta to 3.1.1 in terms of the method I use to achieve multi-tenancy but the code has become a bit cleaner (but the patch required is a bit larger). This time around I’ll skip the commands and just go straight to the code itself. Ever wanted to share your iOS code with others without having them copy your code and headers and hope it compiles properly? Well you can easily do that with frameworks. I had found several guides on how to do this but they were either out-of-date or incomplete. While the iOS App Store doesn’t allow you include dynamic frameworks, you can create a relocatable static framework which functions very simliar with one key difference (more on this later). One more thing we can do to simplify distribution is to create a universal framework so that they same file works on the iOS device (`armv7`) and in the simulator (`i386`). Let’s get started by creating a new project in Xcode. 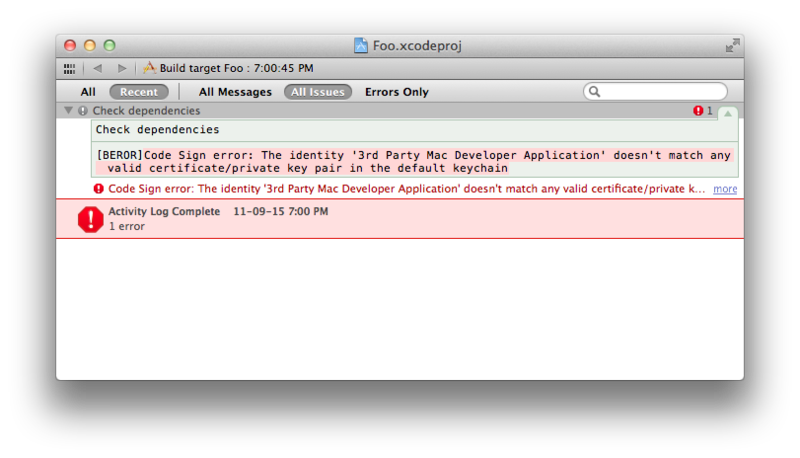 This because by default Xcode will try to sign your code with an identity in your keychain that starts with `3rd Party Mac Developer Application`. To be able to submit apps to the App Store you have to get a certificate from Apple so this is a sane default but I wasn’t signed up of the [Mac Developer Program](http://developer.apple.com/programs/mac/). I was however signed up for the [iOS Developer Program](http://developer.apple.com/programs/ios/) so to fix the error for now I changed the `Code Signing Identity` build setting to `iPhone Developer` and away I went. Fast forward a few days after I had signed up for the Mac Developer Program and I got my certificate. So I got rid of my change `Code Signing Identity` and restored the default. But I soon ran into a problem, my application now crashed while starting up no matter what I changed with a `EXC_BAD_INSTRUCTION` error in some random Apple code. 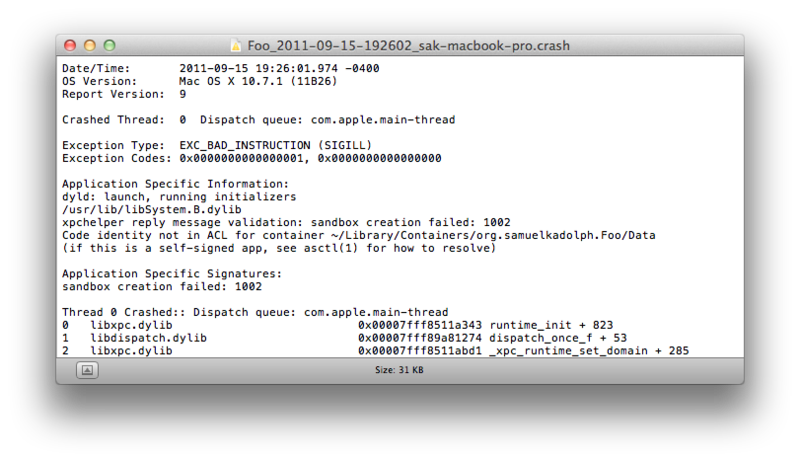 I quickly localized the problems to having entitlements on but the non-existance of any documentation on debugging sandbox errors from Apple I was frustrated. 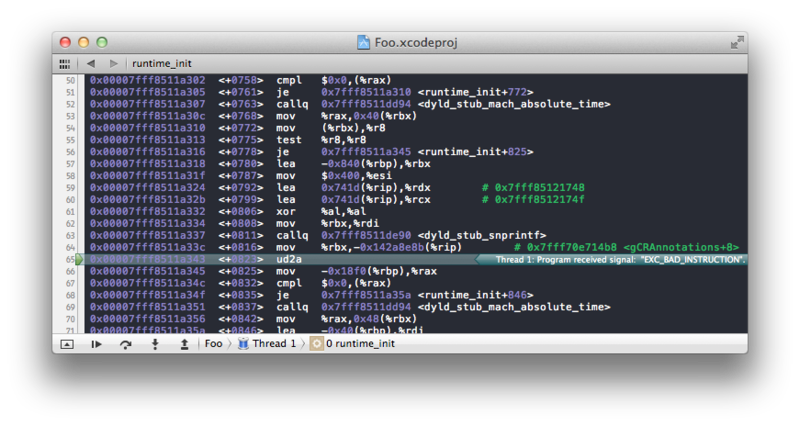 So I fired up my application without Xcode so there would be a error trace I could view in [Console](http://en.wikipedia.org/wiki/Console_(Mac_OS_X)). This was a great idea because I was actually able to see what was the error was. and I suddenly remembered something I read in the [sandbox documentation](http://developer.apple.com/library/mac/#documentation/Security/Conceptual/CodeSigningGuide/ApplicationSandboxing/ApplicationSandboxing.html#//apple_ref/doc/uid/TP40005929-CH6-SW5). By default in the Lion sandbox, you can only access files in a special directory under `~/Library/Containers` which is named after the bundle identifier for your app. And it’s protected to prevent someone from accessing the data in there with a fake app. This protection is achieved by using info from the app which was signed by your code signing identity to confirm a genuine app from a fake. So when I changed the keychain identity used to sign the code I was creating a fake app and trying to access the data. The solution was simple after determining that was the problem. Just delete the container for your app (**and only your app, every other sandboxed app has a container too and may store data in them**). In my case it was `rm -rf ~/Library/Containers/org.samuelkadolph.Foo`. It’s unfortunate that Xcode isn’t more helpful with this error and unfortunate that OS X will kill (*with SIGKILL too*) an application instead of using some error handling in the app itself. I hope this post helps you if you ever run into this problem. One thing I’ve always been wanting to be able to do was parse a [proxy auto-config](http://en.wikipedia.org/wiki/Proxy_auto-config) file from the command line. I only recently found the [pacparser](http://code.google.com/p/pacparser/) library but found it limiting because it isn’t easy to install and use. So I decided to write a rubygem that would parse a pac file. And now you can use the `parsepac` executable. I had always wondered why when I installed jruby using rvm it always built something called [Nailgun](http://www.martiansoftware.com/nailgun/) but I never bothered to search about it. Nailgun is an amazing idea that greatly speeds up the start up time of the JVM and subsequently: jruby. As you can see, nailgun reduced the start up time for jruby by 500%. Now you may be asking “How do I get started using nailgun?”. Well, if you are using rvm then all you need to do is enable the `after_use_jruby` hook which will start up a nailgun server for you. And that’s all you need to do. `rvm jruby` or `rvm use jruby` will now start up a nailgun server if there isn’t one running and it set the `–ng` switch for all jruby runs. If you aren’t using rvm, you will have to compile nailgun and start up a nailgun server with `jruby –ng-server`. Now whenever you run jruby you just add the `–ng` switch and it will use the nailgun server. You may want to `export JRUBY_OPTS=”–ng”` to set the switch for all jruby runs.